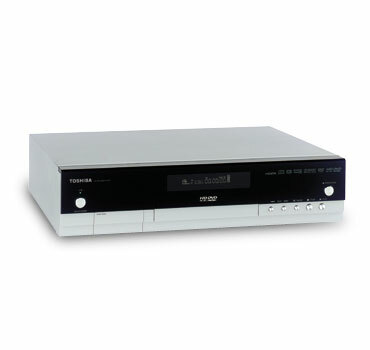 Toshiba HD-A1 Up-Converting HD DVD Player is the first player for High-Definition disk, or more commonly known as HD DVD. The HD-A1 connects via HDMI port to provide 720p/1080i resolution in the native format of HD-DVD disc content. Beside, it’s also backward-compatibility with standard DVDs or other non-HD mode CD including MP3 file CDR. Toshiba HD-A1 able to decode Dolby Digital, Dolby Digital Plus, Dolby TrueHD (2-ch), DTS and DTS-HD Decoding with 5.1 Analog Audio outputs, and has a preprogrammed remote control with TV functions. HD-A1 also able to perform standard DVD up-conversion to 720p or 1080i through HDMI interface. TVS reviewed Toshiba HD-A1 HD DVD Player but not recommended it by giving HD-A1 the rating of 2 stars out of possible 10 stars. It said “summing up, using the Toshiba HD-A1 was a frustrating experience. Beguiled by its gorgeous high-definition video, I was even more frustrated at its sluggish response to remote commands and crashing performance. Its clumsy remote sets a new low in inept design, configured in a way that reveals that its designers were apparently completely unaware that human beings would be using it. Adding to its long list of shortcomings is the HD-A1’s inability to handle that holy grail of the HD DVD format, 1080p. CNet meanwhile rated Toshiba HD-A1 7.0 out of possible 10.0 (Very Good) and concluded that Toshiba HD-A1 is an affordable first-generation HD-DVD player that produces a stunning high-def image–but only home-theater enthusiasts are likely to endure its long list of early-adopter caveats. The good of HD-A1 includes plays HD-DVD discs in true high-definition; upscales standard DVDs to high-def resolution; half the price of first-generation Blu-ray players; upgradable firmware via built-in Ethernet port. However, the bad of HD-A1 long list of no 1080p video output; slow start-up and sluggish operation; confusing audio setup options; network connection can’t be used to stream media from PC; minuscule list of HD titles available; only three major studios releasing HD-DVD discs; discs can be programmed to display at lower resolution when displayed via component-video outputs. PC World (link dead) has a first look on Toshibad HD-XA1, the more expensive model of Toshiba HD-A1 and concluded that HD-XA1 is a little disappointing, especially because of the speed. The player has a hefty price tag–it is currently available in Japan for about $847 and will be launched this month in the U.S. for $800–and the slow boot-up is a surprise. But make no mistake, the picture quality is great and these speed problems don’t affect enjoyment or operation while movies are being watched. Los Angeles Times (link dead) summarized their conlusion as “should you care? Probably not. Because unless you already have a state-of-the-art high-definition television at least 40 inches in size, you won’t notice much of a difference. Home Theater Blog concluded that “please keep in mind this is an entirely new format, even though it’s called HD-DVD it would be a misnomer to simply assume this is DVD’s in HD. While high definition is obviously an element, the format is slightly more encompassing i.e. the promise, once and for all, of generating a viable high-resolution audio format. As with any new format that has to interface with older equipment, the occasional incompatibility issue has a chance to rear its ugly head although I’m happy to report I’ve suffered no such problems with HD-DVD. In almost every scene of every HD-DVD title I viewed on my 80′ screen, HD-DVD trounced all other HDTV sources I have at my disposal. Whether it was through HDMI/DVI or component, the image quality was undeniable. Once high resolution surround hardware is available, the overall experience will surely improve even more. For these two reasons alone I would be hard pressed to not recommend HD-DVD to any videophile. Ultimate AV (link dead) felt that “there are a load of details I haven’t had time to sort over for this report, including a full audition of all the players’ and discs’ sound capabilities, interoperability, and how the new zoomy menus and special features on the HD DVD discs work (or don’t).” The high points for HD-A1 include stunning image quality and potential for much improved audio over DVD, while the low points include sluggish loading, abysmal remote, limited titles available at present, and, of course, that little format war. So far, Universal and Warner has released a few movies in HD format including Swordfish, The Last Samurai, Million Dollar Baby, Phantom of the Opera, Apollo 13, GoodFellas, Doom and Serenity, with upcoming release to be Bourne Identity, The Matrix, Shawshank Redemption, Full Metal Jacket, Jarhead and Chronicles of Riddick.